We’ve been following the recent media reports about oil leaking at the Deepwater Horizon site, and we have received a lot of inquiries about whether we could corroborate these reports. Well John has been out of the office dealing with some family medical issues (don’t worry – he’s fine and he’ll be back soon), so the rest of the team has been soldiering on without him, though we are sorely missing his expertise with the imagery. 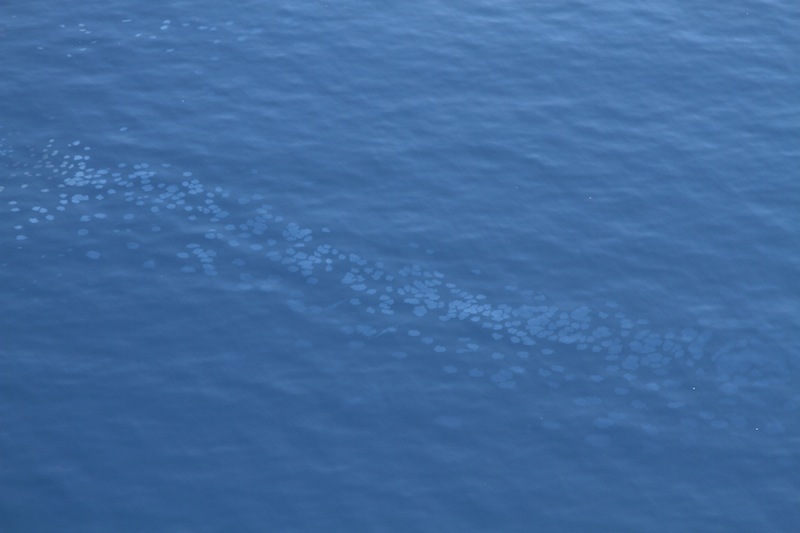 Several media reports last week indicated that a BP submersible working in the Green Canyon area had observed an undersea leak at one of their abandoned wells (which was not the Macondo well, former site of the Deepwater Horizon), and also that a sheen was observed on the surface. The initial media reports may have stemmed from this NRC Report from August 14, which we reported on last week.. Subsequently BP denied that there was any oil coming from any of their wells, and it is certainly possible that the oil observed on the surface came from a different source, or even from one of the several natural oil seeps that are within a few miles of that location. We are investigating the possibility that one of the “natural” seeps observed consistently over time in that area on radar satellite imagery by our colleagues at Florida State may in fact be an abandoned well, but so far we have no evidence to support this. Then, on Friday, August 19, rather than speculate from afar, Jonathan Henderson and Tarik Zawia of Gulf Restoration Network and Bonny Schumaker of On Wings of Care did us all a great service and flew out over the Gulf to have a first-hand, close up look. In addition to posting all the great pictures they took, Bonny was also kind enough to post the GPS log from the flight so that we could see exactly where they went and match that up with our own observations. 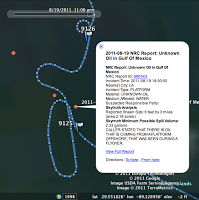 From that flight, there were 4 areas of specific interest where oil was definitely observed on the water surface. 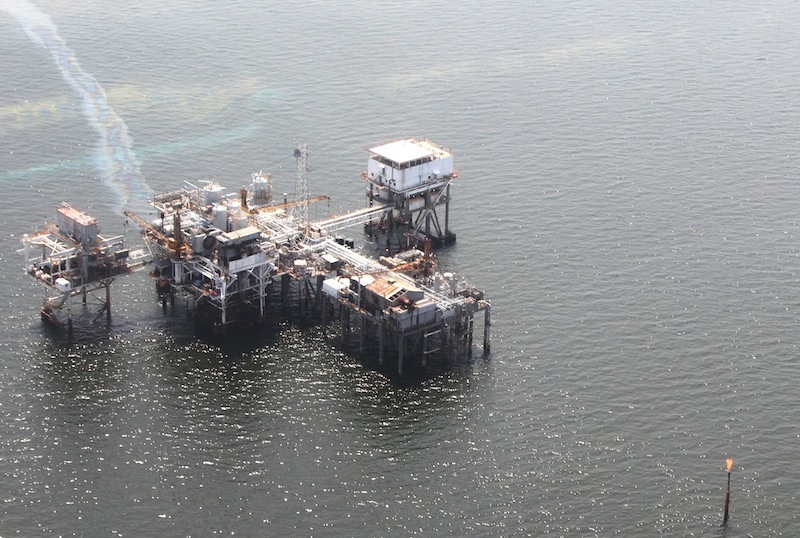 These were: Site 23051, Taylor Energy’s chronically leaking abandoned well cleanup; the former site of the Deepwater Horizon; a mystery sheen observed out in open water; and a sheen coming from a platform operated by Texas Petroleum. Unfortunately, there was no radar imagery available to us (at least not quickly) for that day, and conditions were not good for seeing these slicks in visible light, so we can’t say anything definitive based on our own imagery. For this analysis we are working solely from the images shot by the flight crew. Our analysis: We’re surprised that they didn’t see more oil here. We are routinely seeing 10 mile long slicks at that location in our satellite image monitoring. See our Site 23051 Chronology page for more on the sorry history of this site. 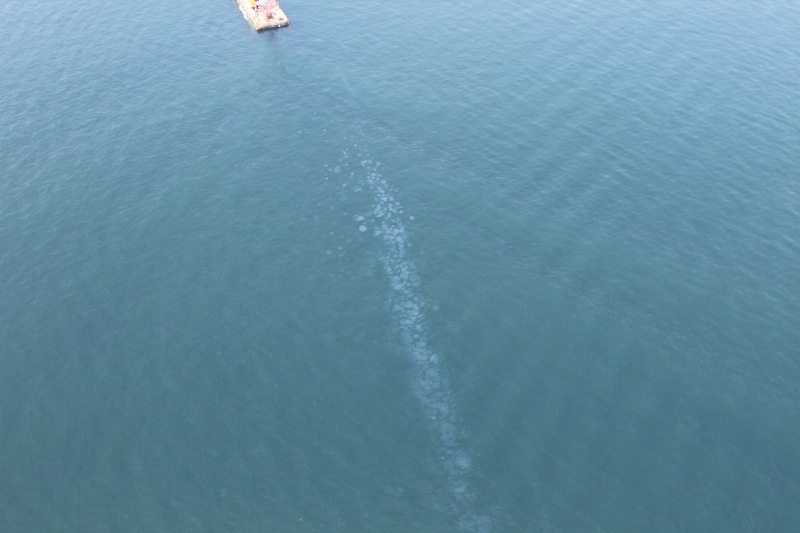 From the photos it looks like what they saw is some minor leakage of oil or diesel fuel, possibly from the work boat on the scene. Flight Observations: Schumaker: “…lines of those strange-looking globules in what was otherwise smooth blue water”. 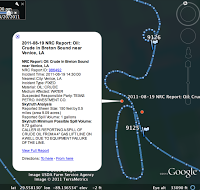 Jonathan Henderson filed this NRC Report in the same location which reports a sheen of half a mile long by 30 feet wide. Our Analysis: Looks like a small amount of oil coming to the surface in droplets, not surprising given how much oil was spilled there last year. If there is a submersible working down there, it could easily be stirring things up, and in any event, there is a massive drill rig, 5000′ of oily riser pipe, a room-sized containment dome that was filled with oil and methane hydrate, and a whole bunch of other oily junk on the bottom that will be slowly leaking drops of residual oil for many years to come. We have seen much more oil coming from the destroyed wells at site 23051, and we are not surprised to see residual oil here. Also note that we have the original site of the Deepwater Horizon over 2 miles to the east of the location where the oil was sighted. Estimated Volume: Going from the photo, we’d say this is too small to estimate. From Henderson’s NRC report, assuming there was a continuous sheen of those dimensions, the volume would be about 2 gallons. However it appears the report is describing an area that is only partially covered by smaller circular oil formations, so in that case the volume will be significantly less. 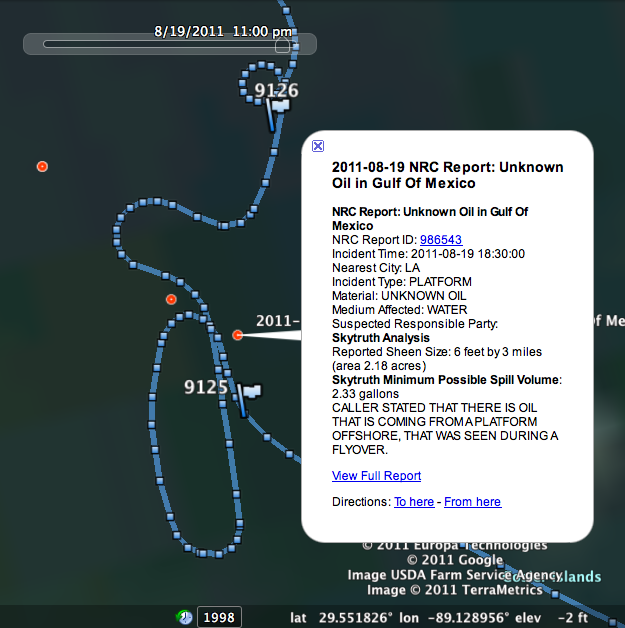 Our Analysis: There is no matching NRC report for this spill, so whoever caused it has not ‘fessed up’. There are plenty of pipelines in the vicinity, but we don’t show one at that precise location. The nearest one is connected to a platform that is about 1.75 miles to the north west. We don’t know of any natural seeps in this location either, though our seep database is limited primarily to deep water locations, and this site is in relatively shallow water. 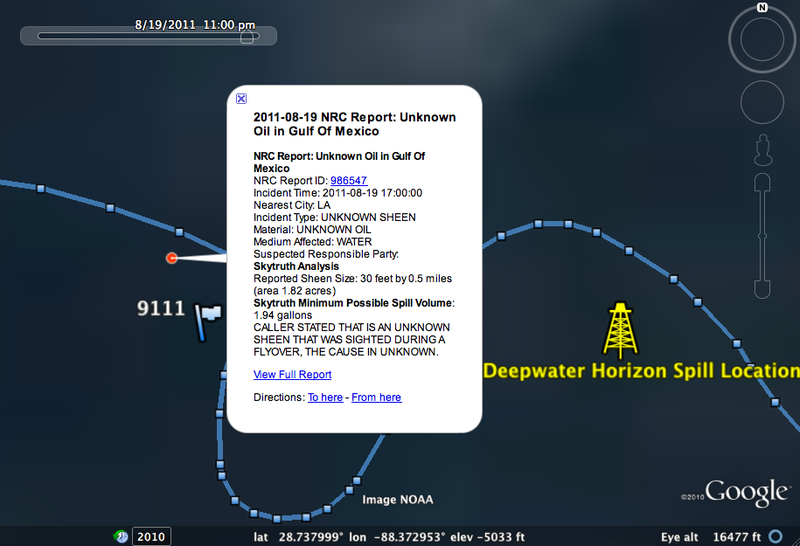 What we can say is that so far just this month, there have been 313 “unknown sheen” reports to the NRC. Of those, 35 were reports of sheen a mile or more in length. Sadly, this sort of thing happens literally every day. Map showing known pipeline locations in yellow with the flight path in blue, site of the observed sheen marked with a blue flag. Our Analysis: The flight team definitely documented a leak from a platform here, and they did a very nice job of verifying the independent report submitted by the polluters themselves the same day. 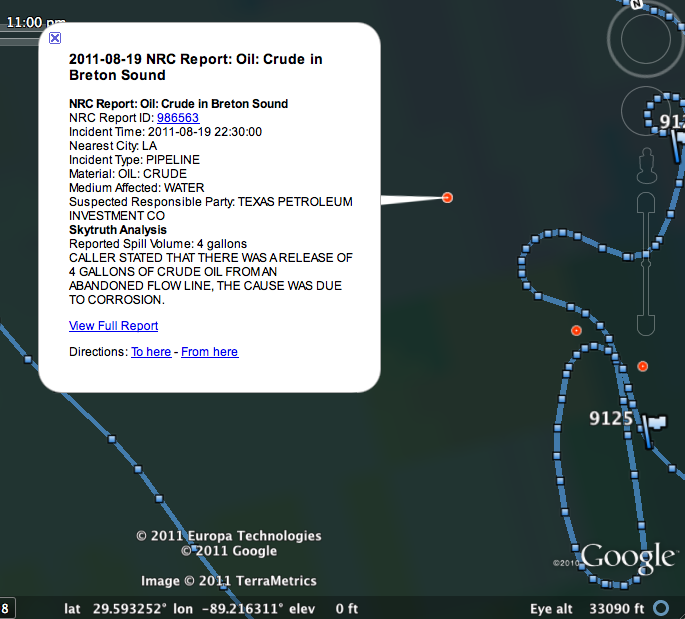 At 2:30 pm that day, Texas Petroleum reported to the NRC that due to an equipment failure at their platform, they spilled crude oil into the gulf creating a sheen 150 feet wide and half a mile long, which almost certainly was the same sheen that the team saw several hours later, which by that time was longer and thinner – 3 miles long by 6 feet wide as recorded in the NRC Report at the same location that we presume was filed by one of the team. 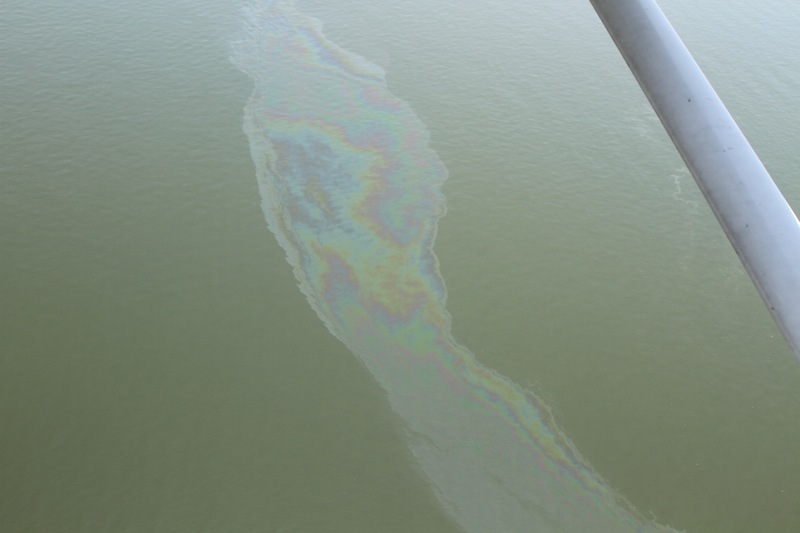 Also, about 2 miles to the north west, there were two other significant spills reported by Texas Petroleum one on the 18th and one on the 19th at the same platform, so the second sheen that was observed could easily have been coming from that platform. 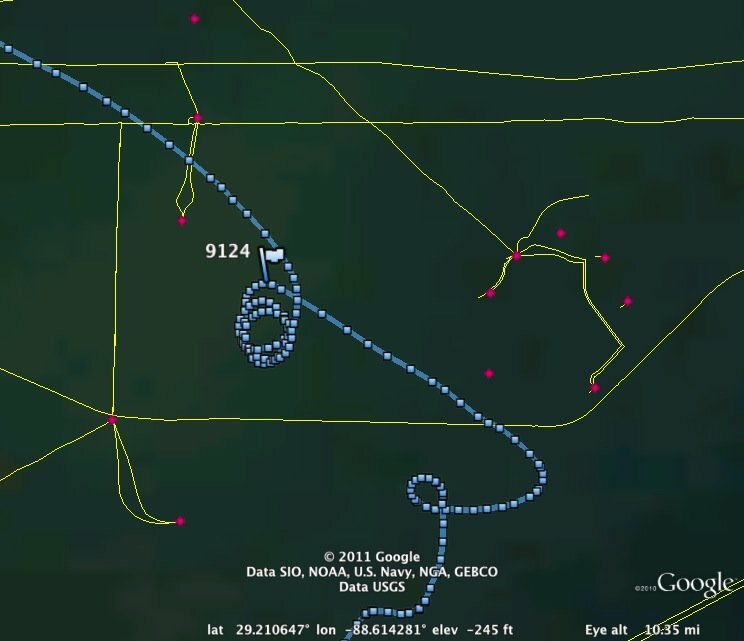 Map showing August 19 flight path in blue, with text and location of nearby NRC report filed by Texas Petroleum the same day. 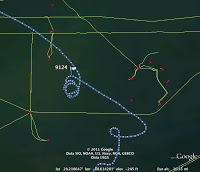 The observations by the flight crew are consistent with those reports. It’s a sad fact that no matter where you look in the oil-producing areas of the Gulf, you will find oil on the surface of the water — some from natural seeps, some from accidental leaks and spills, a sorry state of affairs for sure. 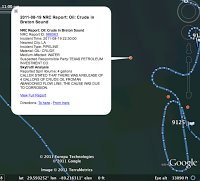 But we’re still not convinced that BP’s plugged Macondo well is leaking. We should expect to see a small amount of oil coming to the surface in that area for a long time to come, just like at the site of the USS Arizona, which sank in Pearl Harbor 70 years ago, and still produces a visible sheen on the surface from oil slowly leaking from its submerged tanks. NJ Beach-goers Sharing the Ocean With Algae Today Earthquakes, Earthquakes! And Drilling?